Ascension of the prism frames Aztec ruins, a striking element of an auditorium that references its cultural roots. This is part of a series of videos featuring winners and finalists from the 2019 Simon Architecture Prize. Within the dense city of Cuernavaca, Mexico lies an ancient Aztec ruin complex known as Teopanzolco, or "the old temple". In 2017, architects Isaac Broid + Productora completed the Teopanzolco cultural center, located directly across from the archeological site. Their goal was to design a space for cultural activities and performances, while introducing ample public space in an effort to highlight the existing monument. 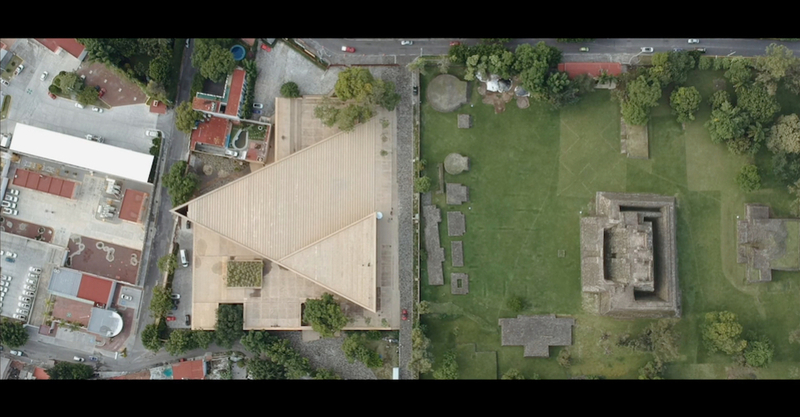 Together with Juan Benavides, they released a film promoting the new cultural center, focusing on how the building elements respond to the city context. Their narrative follows the transition from afternoon to evening at the cultural center as a jazz band prepares for their performance that evening. At the height of day, shots of people climbing and exploring the inclined triangular form set the context for that evening's performance. From a distance, the theater nestles into the urban fabric, its peak gently rising above. Frames of the lobby and audio of the theater space offer a view into what goes on behind the scenes as the band sets up their instruments on-stage. From the inside of the lobby, the light-weight steel entry frames the main temple ruins perfectly. According to the architects, the inclined planes serve to develop a "visual interplay" from all angles of the site. In the evening, the textured concrete forms are illuminated, signaling the approach of the performance. Visitors admire views of the city and ruins from the top of the roof, passing time while they wait. Anticipation and excitement fill the air as attendants begin admitting visitors into the soft-glow of the lobby. Sunset finally affords visitors the moment they've been waiting for. The band's introduction is the only taste we receive of the night's fun- yet leaves us to consider what this new temple has to offer.